Microsoft's first modern wearable is here, and just as we expected, it has its sights firmly set on keeping you fit. It's called the Microsoft Band, and it tracks everything from steps, heart rate, calories burned, and even the length of your strides. Priced at $199, Microsoft Band works alongside Microsoft Health, a new health platform that compiles and analyzes all of your health and fitness data. But the two aren't an exclusive partnership; Health wants to help you stay fit whether you choose to use a Microsoft Band or not. Health apps will be available for Android, iOS, and Windows Phone, and they'll combine with Android Wear watches, Jawbone fitness trackers, and even the motion co-processors built in Apple's iPhones. They'll also pull data from popular fitness apps like MapMyFitness, MyFitnessPal, and Runkeeper. What's more, those building new fitness trackers can let Health be their back-end; they don't need to invest time and money into building their own companion apps and platforms from scratch — everything that's required is available in Health. No matter which products and services you're already attached to, then, Health will bring them all together and make your data accessible from a single repository. That means that if you want to, you can swap your Fitbit for a Jawbone — or even a new Microsoft Band — and you won't have to give up all the data you've already collected. This is the problem with fitness trackers today, says Microsoft's Corporate Vice President of Devices and Services, Yusuf Mehdi, who unveiled both Band and Health at a conference on Microsoft's campus in Redmond, Washington. "Most of these things are individual islands," Mehdi said. "You'll use device X or Y, some stuff is in the cloud, but we think that there's kind of a next step that's coming, which is the ability to unify all that data and democratize it, and then add some real value on top." If you do choose to use Band, you'll end up with a fitness tracker a lot like Samsung's Gear Fit, but perhaps a little more intelligent. As well as tracking your steps, heart rate, exercise data and more, Band can provide you with workouts for the gym, then help you count your reps and tell you when it's time to switch to another exercise. Band also has Cortana built-in, allowing you to ask for things like weather forecasts or details on your next appointment, or dictate text messages and reminders. It will even deliver notifications to your wrist like other smartwatches. Microsoft is focused on keeping things simple, but Mehdi admits that at the moment, the company isn't completely sure what consumers want out of a fitness tracker. Initially, Band will have stocks and weather apps built-in, and Microsoft will monitor how much people use those to determine whether or not they should be kept. Band will also run third-party apps, like a Starbucks tile that shows the barcode for your card and lets you buy a coffee after your morning run without having to take out your wallet. It's still early days for Band and Health, but it's clear that with these two products, Microsoft is serious about becoming a big player in health and fitness. The software giant has massive plans for the future, and it couldn't be more excited about them. Will consumers be as enthusiastic about it efforts? 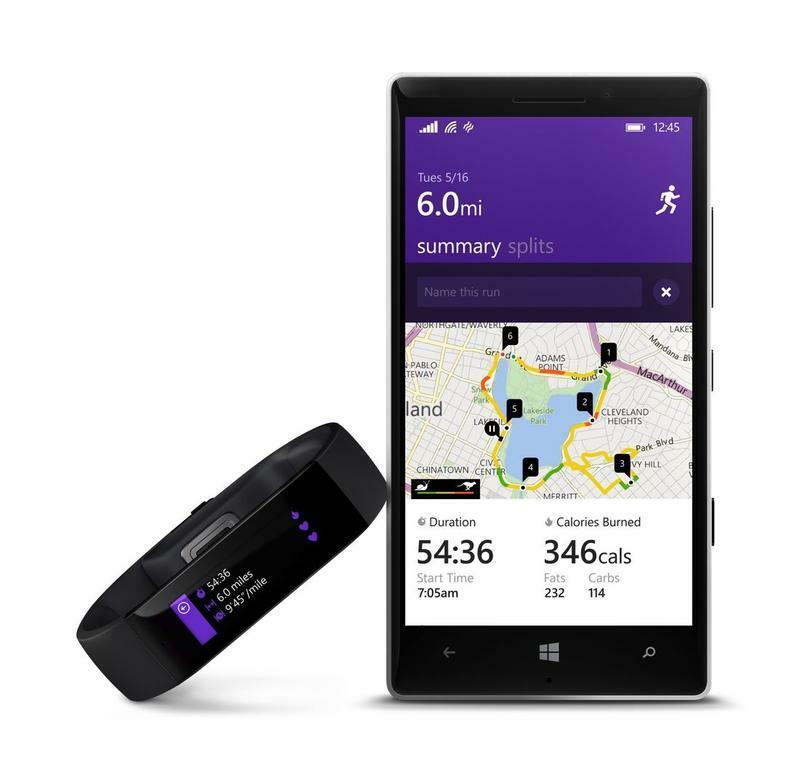 Microsoft Band is available from Microsoft Stores in the U.S. starting today, and Microsoft Health can be downloaded now on Android, iOS, and Windows Phone.